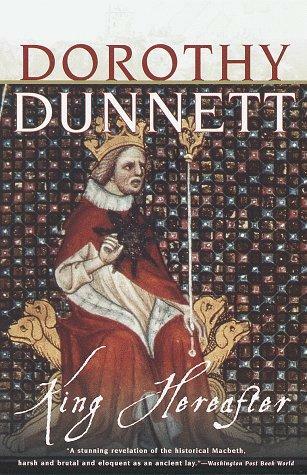 To start this year off right, Sharon from Library Hungry and I decided to do a buddy read of Dorothy Dunnett's King Hereafter, which is a book that's been on my TBR pile for years and years. King Hereafter is about Thorfinn, better known to history as Macbeth, and his rise from an awkward boy trying to defend his small plot of land to a respected king of a vast swath of land. And at his side is his beautiful, brilliant wife Groa, who helps his come fully into his own. King Hereafter is a very long book, so we've broken up our discussion into the books four parts. Below is the first half of our discussion on Part 2. For the second half, please visit Sharon's blog at Library Hungry. The first part of our discussion can be found here and here. Enjoy! Sharon: Wow, does Dunnett know how to end a section or what? You’ve got this story going along and covering so much breadth, and the section comes more and more together until the last chunk which is just insane battling. These are my favorite parts, and this last ship battle is just amazing. I fell in love with Groa and Thorfinn as a couple in this section. The scene when they are in the boat and Thorfinn is asking her to stay strong and not to cry and that he loves her - oh, it was so good. I was also relieved to see that Rognvald was taken care of. I was worried that he would just stick around the whole story and create trouble and misery for everyone, so I am glad that he’s gone and that Thorfinn can move on with his life and his plans now. What did you think of Rognvald? His obsession with Thorfinn was certainly the defining thing about this section. And how his jealousy over not having all of Thorfinn led to him wanting to ruin everything for him. Sharon: Rognvald was a strange factor because his quest was so much more personal than anything else that’s gone on in this book. He made ridiculous political decisions for reasons that were entirely emotional and personal--and people followed him! He had armies and boats and a hird (my new favorite noun, by the way, and I’d like one of my own) who went along with all this. No Thorkel Fostri or Sulian to tell him to snap out of it (not that Thorfinn ever listened to anyone’s advice, either, but at least people were calling him on what they saw as bad decisions). Honestly, though, this very human and messed up rage was what made Rognvald most appealing to me. I felt like I understood what was going on with him--he was crazy with envy and thwarted affection--and when I found his behavior impulsive and often irrational, that felt easier to grasp than the ambiguous political behavior of everyone else. I think my strongest reaction so far of the book has been that scene in the burial mound and the fallout the next day. I was tearing my hair out! So, while it seemed kind of crazed, I sort of loved the Rognvald part. Do you think Dunnett does anything to reconcile the personal and political behavior of all these characters? Like, how serial marriage is about alliance and passion and war, or how some deaths carry all this weight and others that seem like they should have equal political fallout are just the inevitable result of battle? Aarti: Well, Dunnett had the benefit of hindsight, too, so I think that may have come into a bit in the way she presented information. For example, she always talks about Thorfinn’s brilliant mind, but I think at least SOME of that must have been luck and good guessing rather than an uncanny ability to always know the political fallout of an action! I think I understand what you mean about Rognvald. He’s clearly there to serve as a foil to Thorfinn - not only to sharpen his wits and make him always think three steps ahead, but to show what Thorfinn might have been if he had gone another way and let emotions rule his decisions. I think it’s fascinating to see just how strongly people react to Thorfinn. Thorkel loves him like a son but is bitter that Thorfinn does not see fit to trust him with his plans or ideas or to listen to his advice. Groa adores him and he respects her opinion, but she also worries a lot about what is going through his head. Rognvald wants to be him, and as he can’t do that, he wants to be the most important thing in Thorfinn’s life. And so on - no one seems to meet him and not be pulled in by the charisma and brilliance. Sharon: His brilliance vs. luck is an interesting question; I really felt like the book was setting it up as brilliance. I think that feeling mostly comes from noticing that he not only always wins, but he knows when he can’t win and doesn’t fight. Honestly, for the first two sections, I couldn’t figure out why people are always doubting him, when he’s clearly always right. Especially since it seems like that’s what makes him such a great leader--he’s always in control. Aarti: So true! I think people often underestimated him. Though I also think it speaks to him as a leader that he has people around him who offer dissent - clearly, he is confident in his own abilities to ignore them <g>, but that doesn’t mean he lashes out at them. Check out the second half of our discussion on Library Hungry! Dunnett is one of those authors who I am always thinking about trying to read, but am scared and intimidated of, because she knows her history from back to front, and isn't afraid to lay it all on the line for her readers. I have heard that she is a favorite of many, and that her books are out of this world, and now that I have read some of this critique, I am thinking about buying this one. I never read Macbeth, and wonder if this would hinder me at all? This was a lovely review today, and I am off to check out Part 2. Sorry for the lack of emailing prowess that I have been showing lately. I am currently laid up with a back injury, and can't seem to get things done. I will hopefully get to it soon!